All accepted papers will be published in One Health International Jurnal. Guidelines for papers are available here. “ONE HEALTH” – A Single Health for People, Animals and the Environment – is the new Global Concept that brings together specialists’ concerns from all areas that condition health, including Nutrition, and The Occupational, with two main directions of action: Primary Prophylaxis of Life and Post-Therapy Life. Worldwide, the remarkable progress of health care, doubled by better living conditions, is driving continuously to the growth of human life expectancy everywhere. In contrast to this positive development, human health disorders are increasing in volume, diversifying, and implicitly spending and effort to preserve a proper Healthy state are continually increasing and consuming huge, hard-to-reach resources. In this context, a new global medical concept – “One Health” – begins world wide to be organised and find the roots of the evolution of the affections and their spreading and seeks to recommend the appropriate solutions in the areas where human health is aggravated more and more. The concept of “One Health”, a Health for People, and everything that surrounds them, Animals, the Environment and everything that makes it, Nutrition and Food as well as the Occupational, encourages collaborations, synergies and cooperation between all professional sectors and actors that can have an impact on our health. The “One Health” concept implies the inclusion of Human Medicine, Veterinary Medicine, Environmental Medicine, Food and Nutrition Medicine, Occupational Medicine, Comparative Medicine (zoonoses and Comparative Oncology), with PRIMARY LIFE PROFILAXY promoted as a major vector, to apply the health care in the service of desideratum as healthier as possible with lower costs. 2. Keeping in mind that international specialists today consider that over 75% of the diseases have the point of origin in the animals around us and in the surrounding environment, it is necessary that each patient to be analysed not as yet, strictly related to his/her illness, but in a large complex. 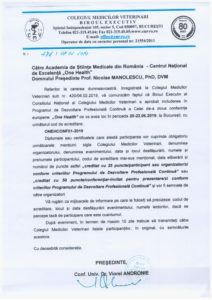 This new thinking and interpretation can not be immediately implemented, and the society as a whole and specialists must be constantly informed and the training in this new field, which is addressed to every citizen of the human community ha to be done gradually from kindergarten to elementary school , high school and post-high school, college and post-college, including doctoral and post-doctoral level. Research will go to the most subtle paths of micro-biotechnology and genetics, and gains in the field of computer science and computer science are necessarily joined. Medical procedures based on evidence from complementary medicine (traditional Chinese medicine, phytotherapy, gemotherapy) should be integrated to achieve the same goal, to have a healthy person using the most efficient techniques and the smallest costs. These include all aspects of food safety, the production of medicines and pharmaceuticals, including bio-products (vaccines). – Increasing the performance and balance of the individual in general and in particular in the work and daily life. 3. Elaboration and implementation of a New National, European and Worldwide Regulations and Regulations to be effective in supporting the implementation of the Concept. – Information and Education of the Population, University Curriculum Appropriate to the Concept and Complementary qualification of medical staff.